Today’s photo of the week is of a curious takahē making new friends during a sunny day at the beach. This photo was taken by Peter Harrison at Tiritiri Matangi Island, a wildlife sanctuary and one of the most important conservation projects in the Auckland region. 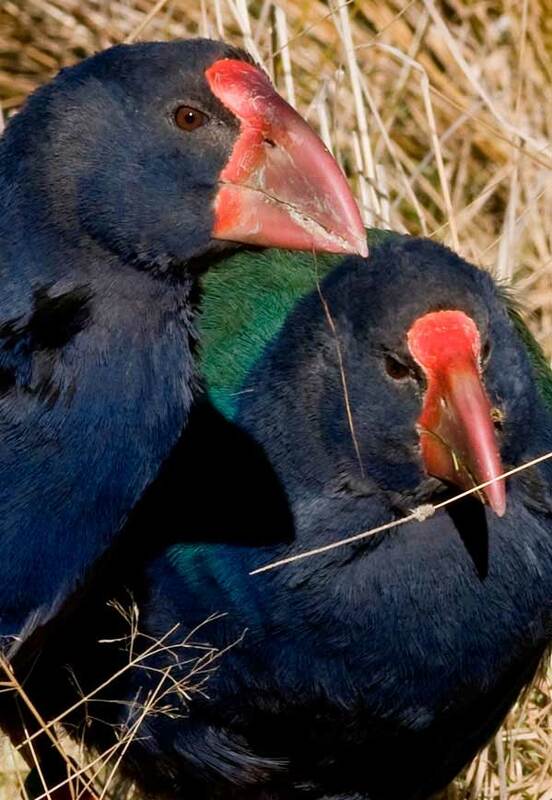 November marks the 65th anniversary of the rediscovery of the takahē in 1948. 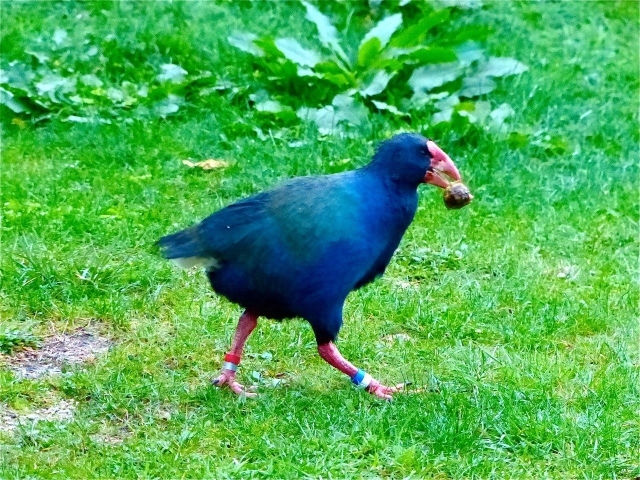 Previously takahē were assumed extinct but were rediscovered by Geoffrey Orbell near Lake Te Anau in the Murchison Mountains. 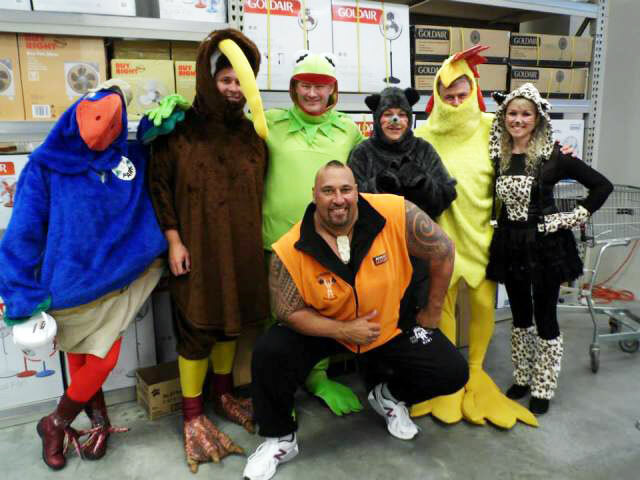 To celebrate this anniversary November has been chosen as Mitre 10 Takahē Rescue Month. 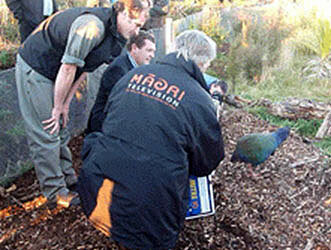 To find out more about the planned celebrations visit the Mitre 10 Takahe Rescue Facebook page. Takahē may look like ‘big blue chooks’, but try catching one and you will discover they are much faster and can out manoeuvre the most skilled bird wrangler. Enter Mitre 10 Takahē Rescue and some keen volunteers, a special island and an opportunity to help this iconic and critically endangered bird. Takahē are critically endangered, and there are only 54 breeding pairs of takahē held at safe sites—mostly predator-free islands. 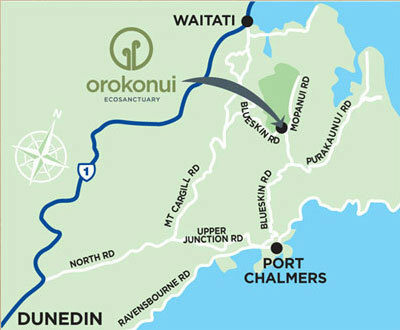 Mana Island is one of these, and Jeff Hall is the ranger with 10 pairs of takahē in his care. To keep the takahē population genetically healthy, birds must regularly be shifted between breeding sites, and therein lies the challenge. Mana Island’s re-vegetation programme is looking good, but it’s making it more difficult to corner the wily birds. In 2011 things came to a head when visiting takahē rangers failed to catch all of the birds required. A new strategy was needed and a plan was hatched. 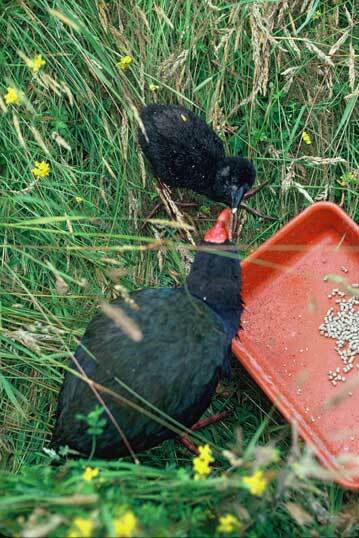 The result—a 10 metre by 10 metre capture pen filled with something that most takahē can’t resist… takahē pellets! Building the pens needed materials and labour, which is where Mitre 10 Takahē Rescue came in. 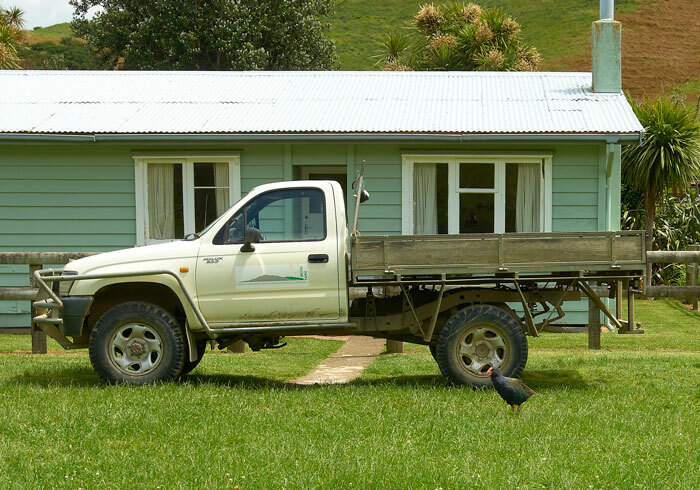 Mitre 10 have partnered with the Takahē Recovery Programme for over seven years now. As well as providing financial support and helping to raise the profile of takahē, Mitre 10 staff also enjoy hands-on involvement with takahē conservation projects. Bright’s Mitre 10 in Mana supplied all the materials required for four new capture pens. Mitre 10 MEGA staff, Kim Olsen from Masterton and Michelle Ledbury from Kapiti, joined DOC Ranger Jeff Hall and volunteer David Marsh—a farmer from Wairarapa—to lend a helping hand. The pen building team spent three days putting in the posts and netting needed to get the pens up and running. The pens are built with a front gate that is open for most of the year. The birds get used to walking into it and feeding from their hopper without feeling threatened. When it’s time for a takahē health check, a change of transmitter, or to band chicks, the front gate of the capture pen is closed. Once they’re in the pen they usually can’t jump high enough to get back out. The huge advantage is that the birds catch themselves in the pen and any management necessary can then be completed with minimal stress on the birds (and the rangers) involved. 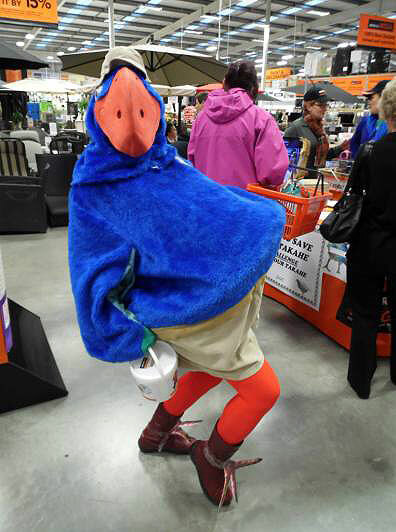 And the Mitre 10 staff and volunteers? Well, they all know what it’s like to be marooned, as the day they were due to head off the island the sea was too rough for them to depart. Two days later they finally got off, but not without anticipating a return journey some time in the future to check out how well their pens are operating! 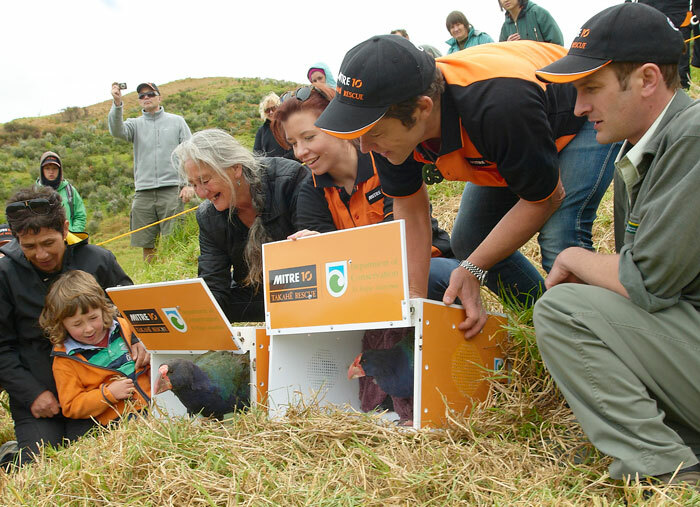 The Mitre 10 Takahē Rescue works in partnership with DOC’s Takahē Recovery Programme and is committed to ensuring the survival, growth and security of takahē populations throughout New Zealand. Find out more about this partnership on the DOC website. From Fiordland to Motutapu island, in the heart of Auckland, is a long way to travel in a day – particularly if you’re a flightless bird. 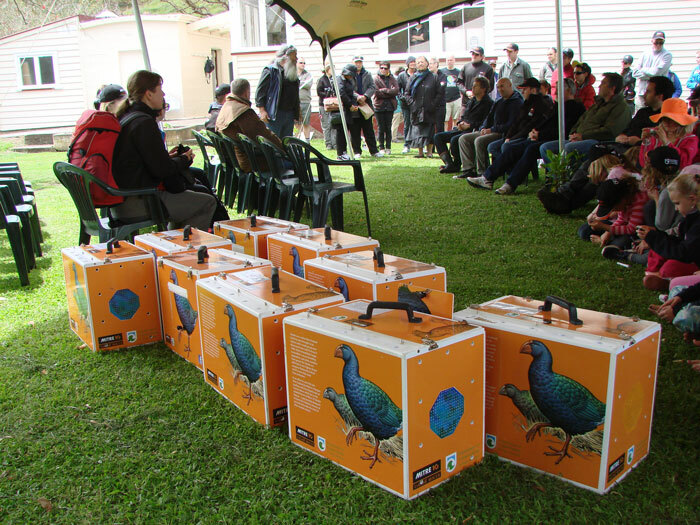 Nine takahē made the journey on Sunday November 4. The birds were captured early in the morning at Burwood Bush Takahē Rearing Unit, near Te Anau, by rangers who run Mitre 10 Takahē Rescue. They were placed in transportation boxes and driven to Queenstown Airport to catch an Air New Zealand flight to Auckland. The birds joined passengers on board a regular Air New Zealand flight to Auckland. 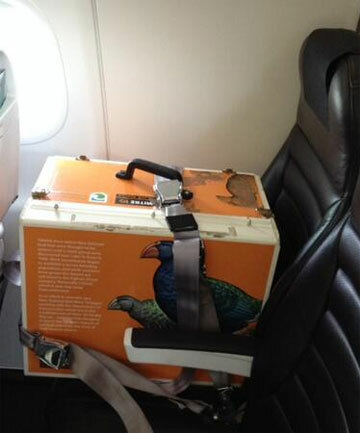 The takahē proved popular with the Air New Zealand stewards and passengers on the flight. They were thrilled to be able to see the rare birds – there are only 260 in the world – inside their boxes. 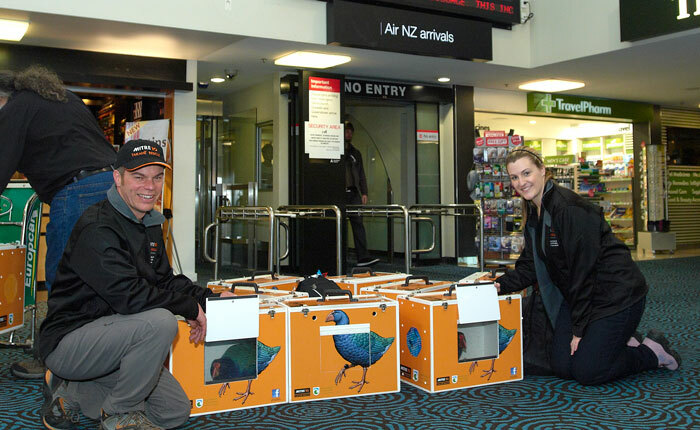 On arrival at Auckland Airport the takahē were carried from the plane to DOC and Mitre 10 utes and driven to Devonport. There they were transferred to a DOC boat, Taikehu, and ferried to Home Bay on Motutapu. Ngai Tahu representative, Stewart Bull, made the journey from the deep south with the birds. He linked with Ngai Tai and Ngati Paoa representatives to provide a powhiri for the takahē on Motutapu. 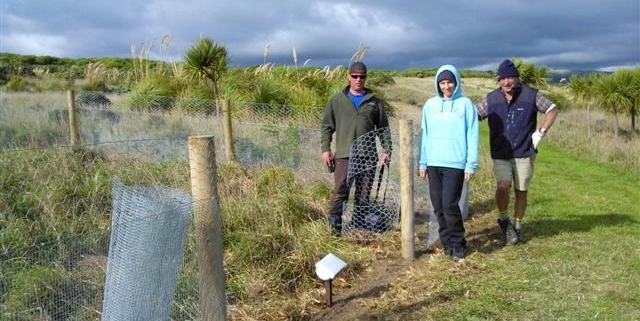 The birds were then released into native vegetation planted by volunteers from the Motutapu Restoration Trust. 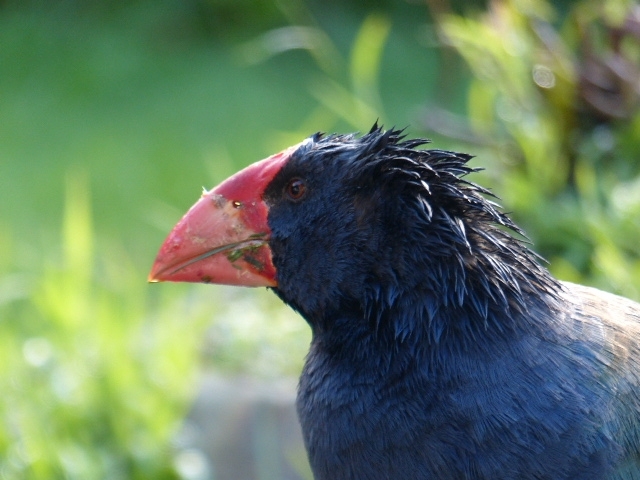 The birds join four other takahē released on Motutapu on August 27 last year. The first release marked the declaration of Motutapu and neighbouring Rangitoto – the islands are joined by a short causeway – as pest free. Ella, one of the takahē released last year, was seen at Home Bay checking out the action surrounding the arrival of the new birds. 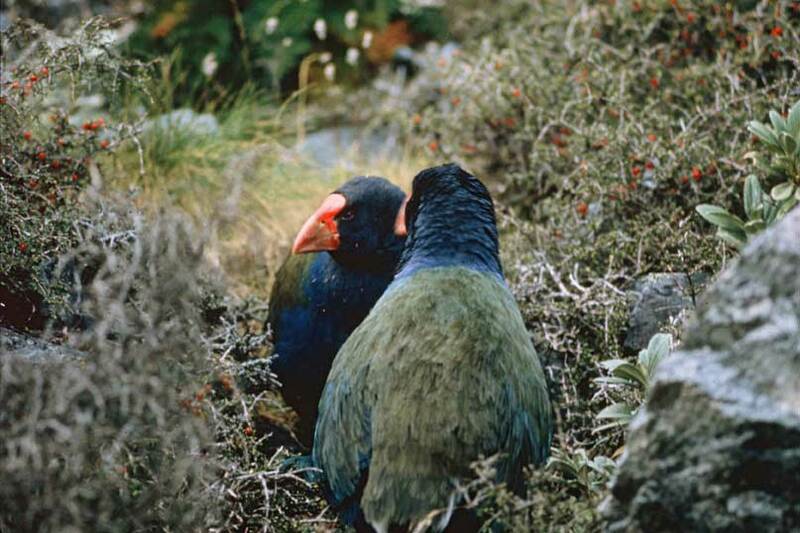 The translocation on November 4 was the largest movement of takahē outside Fiordland ever. The aim is to have up to 20 breeding pair on Motutapu. 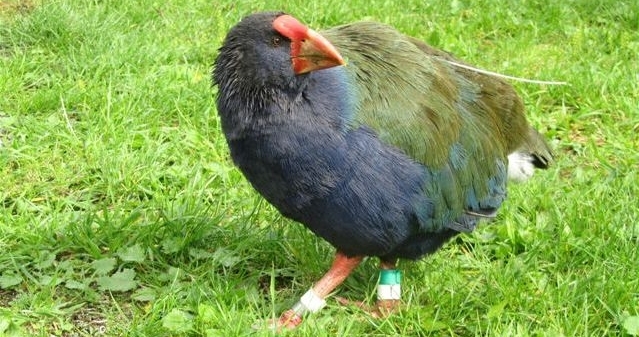 This will make it the largest population of takahē outside Fiordland. 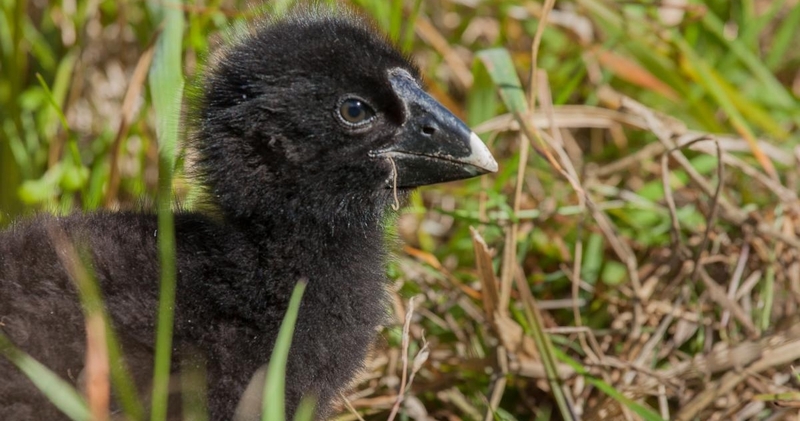 This is an important step in securing the survival of takahē as the other pest free islands providing a safe haven for the species – Kapiti, Mana, Maud and Tiritiri Matangi – are now running out of room for the birds. Motutapu provides a large safe site, with a good habitat for takahē, that will enable the overall population to keep growing. 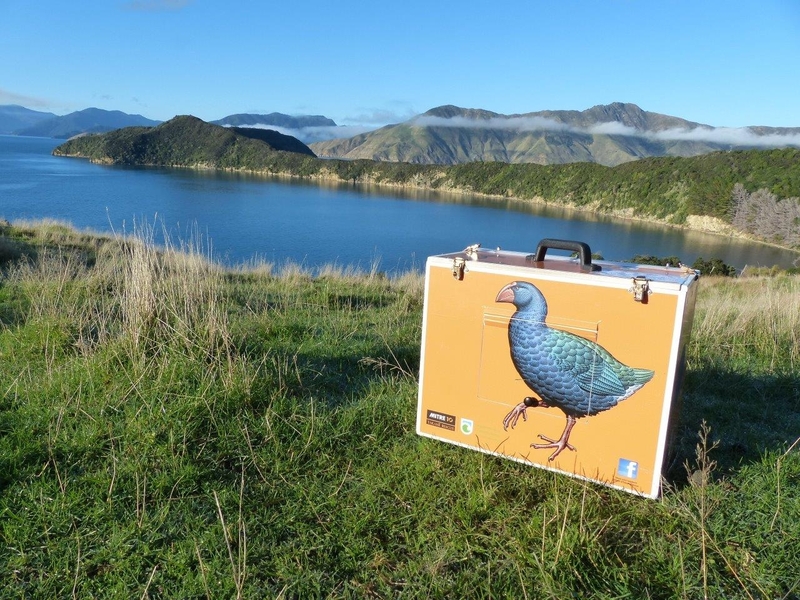 A big thank you to Phil Tisch, the Takahe Programme Manager, who travelled with the birds all the way from Burwood to Motutapu Island; Phil Marsh and Helen Dodson who helped trap the birds in Burwood; Claudia Babirat who filmed the whole transfer; Glen Greaves, the Takahē Productivity Manager, who helped out with the release; and Andrew Nelson and Hazel Speed from Auckland who put a huge amount of effort into organising the event on the day. 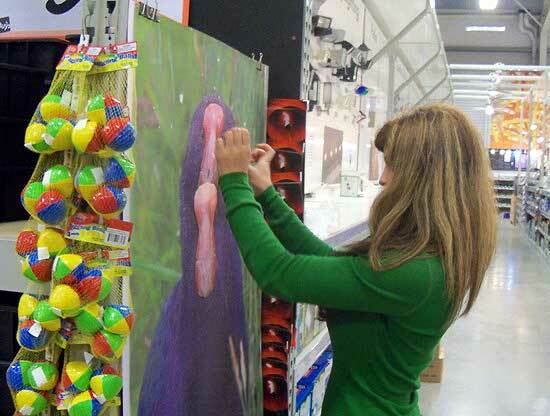 DOC’s partnership with Mitre 10 is crucial in the work to ensure takahē survive. Takahē were thought to be extinct until rediscovered in 1948 in the Murchison Mountains deep in the Fiordland National Park. 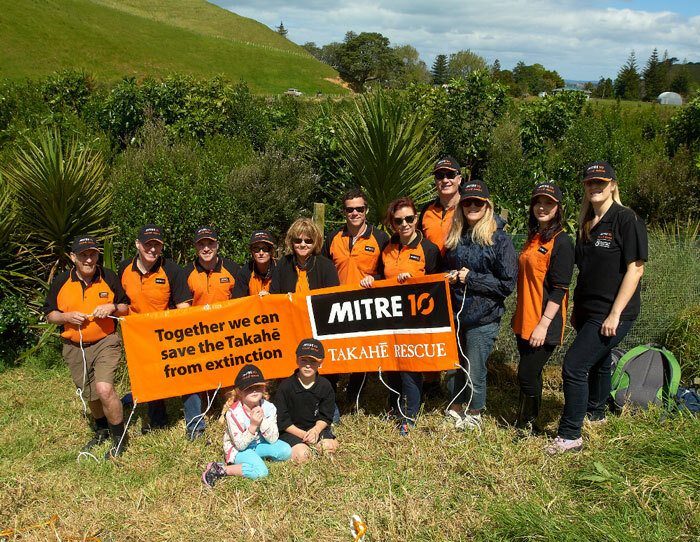 DOC has been working with Mitre 10 to save takahē since 2005.